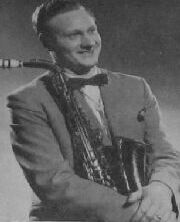 Born in 1929, Geoff Taylor played the clarinet at thirteen and the alto sax at sixteen. He gigged around the Seven Kings area and sat in at various jazz clubs. He won a Melody Maker individual award and turned professional, joining Roy Fox in June 1952 and later worked with Basil and Ivor Kirchin, Oscar Rabin and Denny Boyce. He was spotted by Steve Race playing in an out of town jazz club in 1952 and was chosen to record for the Melody Maker New Stars in 1952. His alto style in those days was of the more conventional swingy style that typified those days and encouraged by being the critics choice on alto he gave up his semi-pro status and turned professional. But the real breaks did not come his way, in fact at one time he was so discouraged with his prospects that he went back to his previous day-time job. Then he heard Earl Bostic on a Continental radio station for the first time and fell for Bostic's swingy style and made up his mind there and then to form a professional sextet playing that lusty, jumping music. His luck changed - broadcasts, concerts, and one night stands began to come his way and at that point he was offered a recording contract. He signed a recording contract with Esquire to record through the mid 1950s. Led his own successful Earl Bostic-styled group in the 1950s and 1960s. He then left full time music, but continued to freelance (mainly round the Romford area) in the 1970s, and then quit playing. Resumed regular playing in the 1990s and freelanced throughout the London area. Following a period of illness he died from cancer, at the age of eighty, in October, 2009. Geoff Taylor (as), Ken Thorne (vib), Dave Fraser (p), Eric Ford (g), Danny Hagerty (b), Freddie Mandon (d). Charmaine/I Can't Give You Anything But Love/Oh Lady Be Good/Wrap Your Troubles In Dreams. Geoff Taylor (as), Ken Thorne (vib), Al Mead (p), Barry Fox (g), Bill Thorne (b), Len Jivesey (d). All Of Me/Easy Going/Solitude/The One I Love. Geoff Taylor (as), Garry McLaughlin (vib), Al Mead (p), Eric Ford (g), Bob Bryan (b), Nick Nichols (d). I'm Beginning To See The Light/I Surrender Dear/I Can't Believe That Your In Love With Me/Geoff's Jump. Geoff Taylor (as), Martin Slavin (vib), Al Mead (p), Eric Ford (g), Bill Thorne (b), Nick Nichols (d). Shanty In Old Shanty Town/Makin' Whoopee/Blow Man Blow/The Lady Is a Tramp. Geoff Taylor (as), Martin Slavin (vib), David Lee (p), Jimmy Currie (g), Bill Sutcliffe (b), Kenny Clare (d). Sweet Sue*/Sweet Lorraine*/Sweet Eloise/Sweet Georgia Brown (MS out). This page was last updated during January, 2011.